The first question everybody wants an answer to is: "How do I control my nervousness before, during and after my audition?" To combat the physical effects of nervousness  which usually include but are not limited to an increase in heart rate, increase in rate of respiration (faster breathing), increased levels of adrenaline, muscular tension and tightness  I recommend deep breathing. The key to success in controlling nervousness at auditions (or anywhere for that matter) is "relaxation through deep breathing." Here's a simple deep breathing exercise I highly recommend you use when you find yourself at an audition when you start to feel the effects of nervousness kicking in. Very slowly and deliberately take a full breath in through your nose. Yes, I said a full breath, one that completely fills your lungs with air. Just as slowly, exhale the air out through your mouth in as much of a relaxed manner as you can. Make sure that you exhale all of the air out of your lungs so as to not leave any stale air (air that your body has metabolized) in your lungs. Just remember, completely full, completely empty. Another important factor to remember while using this technique is to create a slow rhythm to your breathing by counting to yourself slowly, in for 4 counts and out for 4 counts. I highly suggest you close your eyes while you're breathing to alleviate any or all distractions to aid in quieting your mind as much as possible. The key to success in attaining a relaxed state of mind is how you breathe and the amount of oxygen you have in your body during those stressful moments. Start practicing now! Along with talent, most adjudicators look for players with good fundamentals. I would say that many adjudicators would prefer a student with solid fundamentals who is not quite polished as a performer, to one who performs well but needs some major rebuilding in the approach to the instrument. Choose the audition pieces as early as possible. Learn the tempos, notes, rhythms and interpretative markings for a few weeks and then lay the piece aside. I often find that while working on other pieces for a while, those that you intend to use for audition mature on their own and feel more familiar when gotten out again and worked on. • Purchase authoritative editions of the music you're playing. • Study recordings of the pieces if available. • Have your instrument serviced before the audition. • Spend a few practice sessions recording your audition. • Critique the recordings with your teacher. • Play a mock audition for your private teacher, family and friends. Be Prepared  This is the single most important factor that leads to audition success or failure. You must know your music. At the audition you want to play the music at the best of your ability. 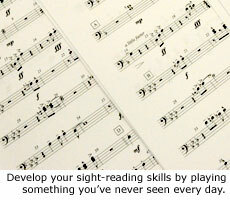 Sight-Reading  I highly suggest you practice sight-reading every day. At some point while you're practicing, open an etude book to a page that you've never seen. Give yourself a minute to look the music over (key signature, tempo markings, meter articulations and such) and give it your all. It'll help greatly if you can perform it in front of someone who can point out any mistakes that you might have made. Sight-read an etude a day. Plan Ahead  Make sure you have left yourself an adequate amount of time to prepare the music. Read the application and audition requirements completely and carefully. Re-read all materials just to be sure. Get a Good Night's Sleep  Try to do everything the day before as you normally do. Do not go to sleep much earlier than your body is use to, as you will end up tossing and turning and getting a worse night's sleep. Eat Properly  Do not eat foods that are spicy and may upset your stomach. If you are too nervous to eat, force yourself to eat something. Hydrate  Drink plenty of water the night before and the day of the audition. The more water in your body the better chances of avoiding cotton or dry-mouth. Think Positively  When you think about the audition, visualize yourself going into the room with confidence and hear yourself (in your mind) playing the best you can. Do not think of the audition as some scary horrible thing. The audition is something that you should be excited about. You want to say to the panel "Look what I can do!" not "uh, I hope I don't mess up." Focus on your playing and technique with confidence. 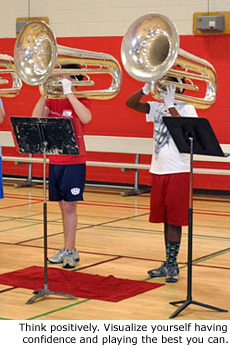 Wear Comfortable Clothes  Make sure you're comfortable playing in the clothes you've chosen to wear at the audition. Double check to make sure that your garments will not negatively affect your performance in any way. Leave Plenty of Time  Make sure you have directions to the audition location. Study a map to make sure you know exactly where you're going. Then decide on what time to leave. Make sure your car has enough gas. Check to make sure you have your instrument and all necessary music with you. Make sure you have a contact number just in case you get stuck in an unexpected traffic jam. Warm Up  If possible, warm up before you leave home. Then plan to arrive at the audition location about 1/2 hour before the audition. Sign in. Find the rooms you need to know: the audition room, the warm up room and the bathroom. Don't listen to others practicing their material and don' t listen at the door of the audition room! You cannot control what others do, so forget about them. Concentrate on playing the best YOU can. In The Audition Room  Treat the audition like a professional performance using proper etiquette (Mr. or Ms. or Professor, no names please! 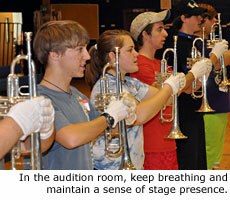 ), and have a sense of stage presence even if the audition is in a small room. Play each piece from beginning to end without stopping unless prompted by the adjudicators. No grimaces after mistakes! Keep breathing, you can't audition if you faint or lose control, stay relaxed! Use the deep breathing exercise I mentioned earlier. More than likely you will not be asked to play everything that you prepared. The adjudicators will select what they want to hear. Remember, they are not your enemies. They are nice people who want you to succeed and play your best. Sometimes in an audition the adjudicators may ask you to play something again with some sort of interpretative change in it (expression or inflection, for example). This doesn't mean that your first rendition of the piece was incorrect but they may want to see how you take correction and how you might react in a rehearsal situation. Even if you think what they're asking for is something that you've already demonstrated in your first rendition, perform it once again really emphasizing what they're asking for. When finished, be ready to receive a full critique of your performance. Be appreciative of the time given and the comments offered. After The Audition  Don't freak out. People often like to beat themselves up after an audition. Be realistic with yourself about how you played. Look at the overall impression you left. Think about what you did well and what you could have played better. Write down any suggestions concerning performance or preparation that might help you for the next audition. Remember, auditions are not only to evaluate your playing ability; they're also to be used as a learning experience for the future. Author's note: I'd like to recognize both Barrick Stees: "Preparing for College Auditions" and Lois Ash: "Preparing for your Audition" as contributors to this article. Wayne Downey is the brass arranger/composer/supervisor for the thirteen-time DCI Champion Concord Blue Devils Drum & Bugle Corps and is a member of the Drum Corps International Hall of Fame. Being distinguished as one of the finest brass teachers/clinicians and arrangers in the world, Wayne enjoys an active teaching schedule in the capacity of arranger and musical consultant with the Tony & Emmy Award winning show "Blast", the DCA Champion Syracuse Brigadiers, as well as many fine high school and college programs. Known for his work in educational music publishing, Wayne offers custom band warm ups, brass & percussion technique books, solos, ensembles, custom designed marching band and indoor percussion shows and accessories through his website at www.XtremeBrass.com. Text copyright XtremeBrass, LLC. 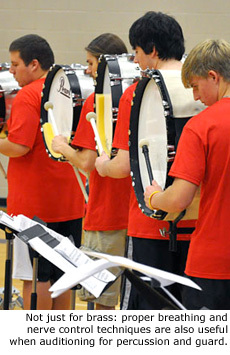 Images by Marching.com.